Yamaha released first teaser of its upcoming YZF R15 Version 3.0 Moto GP Edition and it is already available in some Asian markets and this is the first time the company is introducing Moto GP Edition in India. 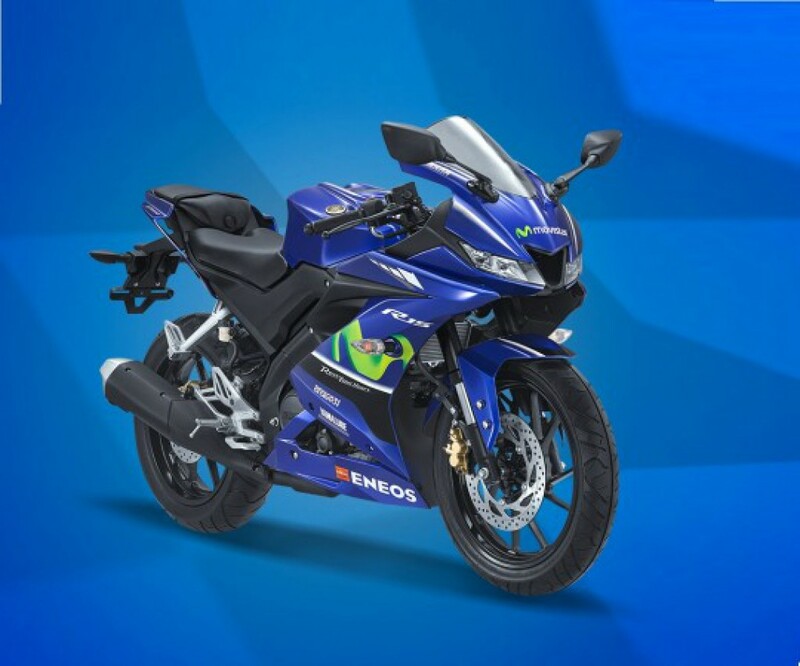 The R15 Version Moto GP Edition is finished in signature racing blue colour of Yamaha with Movistar logo between front headlamps and ENEOS logo on the lower part of fairing. The only thing that is missing on Moto GP Limited Edition bike is racing number of Valentino Rossi and Maverick Vinales. We are expecting Yamaha to introduce Moto GP Edition by the end of this month as they want to capitalize on festival season rush. The Japanese manufacturer hiked price of R15 Version 3.0 by Rs. 2000 last week and currently retail at Rs. 1.27 lakh, we can expect the limited edition model to be priced around Rs. 1.32 lakh (Ex-Showroom). The R15 Version 3.0 made its India debut at 2018 Auto Expo and it is powered by new 155 cc single cylinder, 4-valve, liquid cooled engine producing 19 bhp of power at 10,000 rpm and 15 Nm of torque at 8,500 rpm. This engine is mated to 6-speed gearbox and top speed is 135 kph. Yamaha is offering telescopic suspension for India spec model as other markets get upside down forks, rear gets mono suspension. The company has tuned the suspension for handling rather than comfort as the riding position of R15 is sporty with clip on handlebar and rear set foot pegs. The new generation R15 comes with full LED headlamp along with digital instrument cluster. Yamaha has given 282 mm front disc and 220 mm rear disc but the company is not offering ABS and it is expected to be be introduced next year. The R15 rides on 17 inch alloy wheels with 100/80 section tyre at front and 140/70 section tyre at rear.